At our annual general meeting on October 5th (location TBD), Bike Baton Rouge members will be voting on adopting a new set of by-laws for the organization. By-laws are the 'constitution' of any non-profit organization such as Bike Baton Rouge, and describe how that organization should be run. All Bike Baton Rouge members will be eligible to vote on the by-laws - either at the meeting itself or online here. You can sign up for membership here any time or at the meeting itself. Read more about the changes to our by-laws and put your vote in here. Why else should you be a Bike Baton Rouge Member? 1) It helps us be your voice. When we talk to elected officials or employees of the city (or state) about bike issues, we use our membership statistics to help our case. If we tell those people that we represent over a hundred paid members of Bike Baton Rouge, they listen a little harder than if we were there alone. Those people make and enforce our laws and buy the infrastructure that we'll be riding on in the years to come. 2) It helps us help others. The money raised from memberships goes directly back to making bicycling in Baton Rouge safer, easier and more enjoyable. Our most notable examples from 2016 include our light donation program, which has seen four hundred sets of LED bike lights donated to people without them (mostly by the BRPD) - and the Bike Baton Rouge Map stickers which we are putting up around our city to help people get around town easier. 3) It helps you help us. We are a 100% volunteer run organization. Our members make us who we are - from our board of directors, to the people who put on our bike rides, and the people who staff our volunteer events like bike parking. Thank you for supporting Bike Baton Rouge! 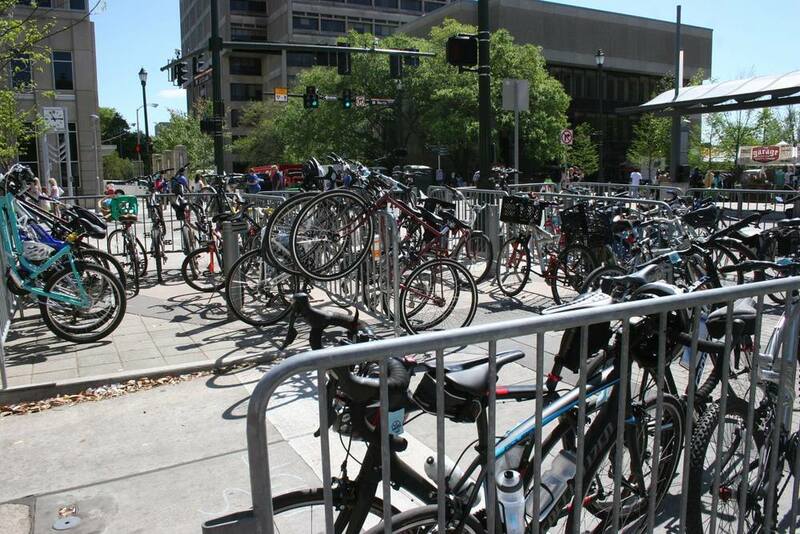 Bike Baton Rouge will provide free valet bicycle parking services in downtown Baton Rouge throughout April at Fest for All, the Baton Rouge Blues Fest and the Earth Day Festival. Bike Baton Rouge volunteers will park and monitor the bicycles in a secured area that is provided by festival organizers. Each festival will take place at or near North Boulevard in the Town Square area of downtown Baton Rouge. Biking to a festival on a weekend is a simple first step for anyone interested in riding a bike around Baton Rouge. Bike Baton Rouge has provided free bike parking services in downtown Baton Rouge since 2006. Bike valet services will be available at each festival from opening time to half an hour after closing. Earth Day will also feature a children’s bicycle safety course, with bicycles and helmets provided.